"It appears we have appointed our worst generals to command forces, and our most gifted and brilliant to edit newspapers. In fact, I discovered by reading newspapers that these editor-geniuses plainly saw all my strategic defects from the start, yet failed to inform me until it was too late. Accordingly, I am readily willing to yield my command to these obviously superior intellects, and I will, in turn, do my best for the Cause by writing editorials - after the fact." What a perfect quotation for today. Question: from where was that masque of death labelled Mr. [Tom] Lantos exhumed, and to where can we return him. What a horror! Reminded me of a villian in a Batman movie! Yuck!!! Lantos was with Pelosi on her trip to pay fealty to Assad The Stiff. He was loud & proud, over there, undermining the Bush Administration (which is, you know, not really American, so no foul). 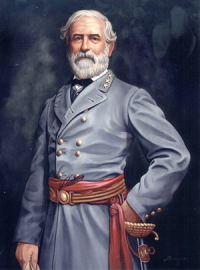 When one has read about Robert E. Lee, both his military and civilian life, it is not hard to see why he is held in such high esteem. The North produced a man of very similar and wonderful character, both military and civilian, Joshua Lawrence Chamberlain . By comparison this country is totally bereft of men of this quality today. I will not say that surviving Hitlers concentration camps was no small feat by the Democrats use Tom Lantos as their shield against charges of what they truly are trying to accomplish. He was of course a mere child when he endured the horror of the camps, but now, as a grown man he must know that the Democrats represent the type of oppression he suffered. One wonders why he do so. You know Habu, I think there are such men as R.E. Lee around today. But it is a much different world today, obviously. Life was not so filtered then, not saying it wasn't at all, but there was more opportunity back then for a man/woman to be recognized on their merits. Just the sheer number of people now vs. then has incalculable effect. But I think mostly the reason is need. There was need for such men as Lee, Grant... etc., back then, or, really, in any of our great wars. We are not at war, we are at the mall... should we become at war, the great men will stand out. Politicians are not an exception in this regard. No doubt there is truth in what you say...you think we could get NASA to task the Hubbell scope on Earth in hopes of finding the "brighter lights"? If we can find them in time. Damn, could have sworn the fields were filled in. Nah, no Hubble needed Habu, you evade my point. The brighter lights are there, just the 'telescope' we are now using does not pick up that wavelength. When it is truly dark, then will they shine. We will persevere. "The brighter lights are there, just the 'telescope' we are now using does not pick up that wavelength". Well said, Luther. Very true. Well, It's like I said, " There are more than enough people out there to do the job, all bright ,intelligent,honorable men"
I wish you guys wouldn't be so down on the quality we do have today, especially in light of the greater complexities of modernity. You know a little faith in the system can go a long long way. So I say buke up and let's rally around the good ones!! Not down on the quality at all - they just aren't in the right places. The question is how to put them there. Funny how the simple word, 'thanks', was caught by the span filter. Yeah Habu, I saw that :)... just lets just not give up before that last dying Marine in his fighting hole is dead. It is a 'long war', after all. We are way past contributing, it is our job to pass the torch through inspiration and elucidation of the threat. Not regret at what we do not have. Semper Fi. Luther ..you're an inspiration and I appreciate it. You're right, we need to keep the torch lit, held high and pass it to those who will continue our great history..
Well Habu I get a little serious at times. I just hate to say we're done, before we are. Besides, what Marine has ever had all that he needs? We were lucky to have plenty of ammo and a stiff cocked "Corpsman" behind us. All else was luxury, really. Ha, I see how that reads in preview... well the Navy was good for something :) Those who know will get my point.